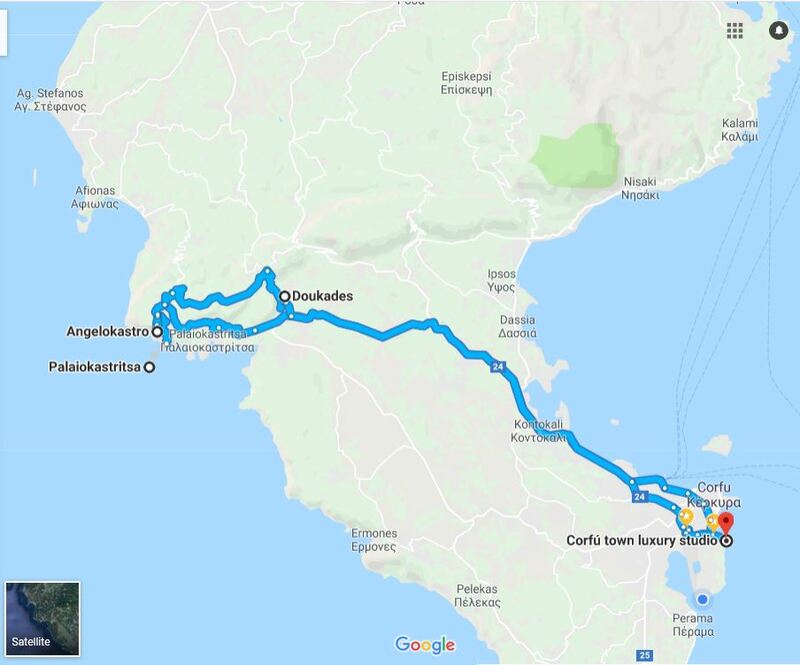 Reccomended daily trips in Corfu Island. 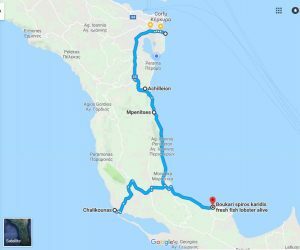 If you have a car you will have the opportunity to visit magnificent landscapes, traditional villages and of course fantastic beaches in the northern and in the southern part of the island. 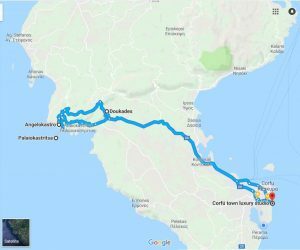 So here are some trips in these areas as well as some useful tips. 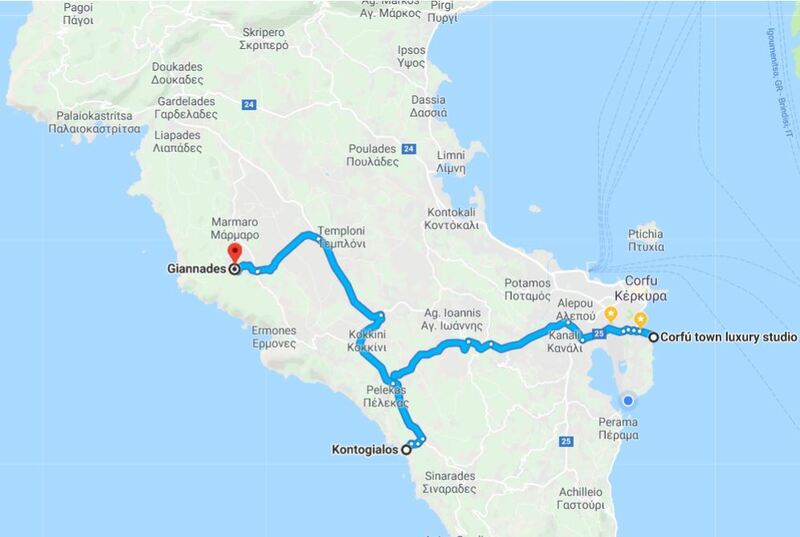 The concept is to begin your trip at about 11:00 in the morning , go swimming, then later in the afternoon go for dinner in a restaurant outside the Town and return to Corfu Town Luxury Studios late in the evening. [Central Corfu Trip about 50 km]: Corfu Town , Glyfada or Kontogialos (Pelekas) Beach for swimming – Proposed places for having your dinner before you return to Town: Kontogialos Hotel, or Taverna Stavrodromi ,or Maragos grill taverna at Giannades village or greek taverna at the square of Kastelani village. [Northwest Corfu Trip about 70 km]: Corfu Town, Palaiokastritsa where you may swim and visit the monastery. You may eat at Vrahos restaurant, or at one of the restaurants in the Doukades village. If you have time go to Lakones (astonishing view) and visit Aggelokastro (the Bysantine castle). 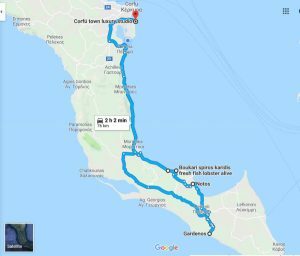 [Northwest Corfu Trip about 100 km]:Corfu Town, Agios Stefanos (Ayliotes) sandy beach 1h drive, or Agios Georgios Pagoi. 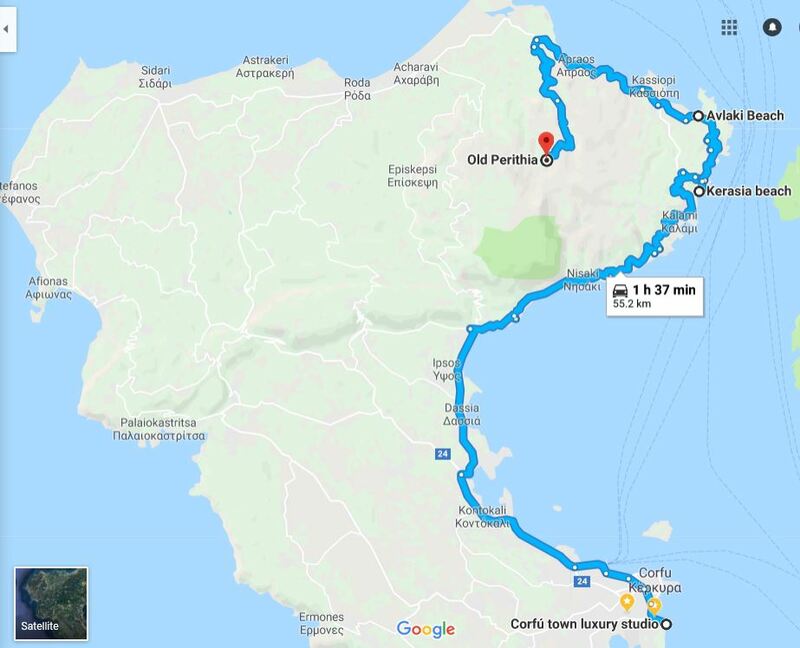 – Proposed places for dinner before you return to Town: at the village Afionas :Dionysos Restaurant or Porto Timoni or Anemos Restaurant. 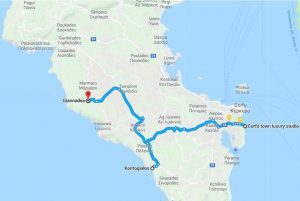 [Northeast Corfu Trip about 100 km]:Corfu Town,Kerasia Beach for swimming, visit Kassiopi village or the Old Perithia mountain village. You may eat at Pefko restaurant in Avlaki beach or at one of the Old Peritheia’s Taverns. Also dont’s miss out Spiggos ice cream on the main road to Perithia. You may find very tasty plates in one of the Agni Tavernas (Toulas). A very good seaside restaurant in Marina Gouvia (near Corfu Town) is Olympia Mare. Also, the fish taverna Kostas in Dasia. [Northcentral mountain Corfu Trip about 100 km]: Head towards Dasia, Ipsos and climb the Pantokrator mountain towards the village Spartilas. From there you may easily go to the highest pick of the mountain to admire the view Pantokrator_Monastery. 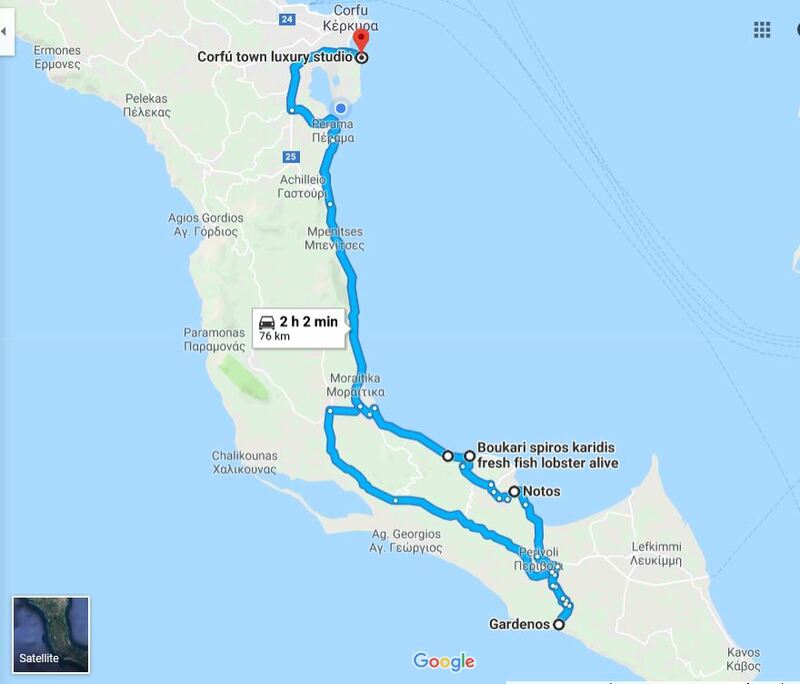 Go north , pass the villages of Sgourades and Episkepsi and go down to Acharavi beach. There you may have dinner at Maistro Restaurant or the Veggera beach bar. 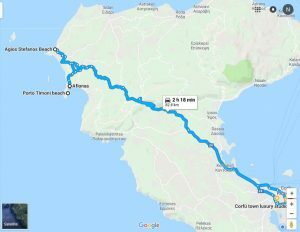 [Southern Corfu Trip-1 about 90 km]: Corfu Town, visit Achileion, Benitses village, swimming at Chalikounas beach (beach bar Tayo-Don’t go if it is a very windy day) or Issos beach. Dinner at Taverna Alonaki very close to Chalikounas beach or either at Bellos Taverna or Paxinos Restaurant in Benitses. You may also try one of the seaside fish tavernas at Boukari (e.g. Taverna Karidis). [Southern Corfu Trip-2 about 110 km]: Corfu Town, swimming at Gardenos beach or Agios Gordis of South Beach. 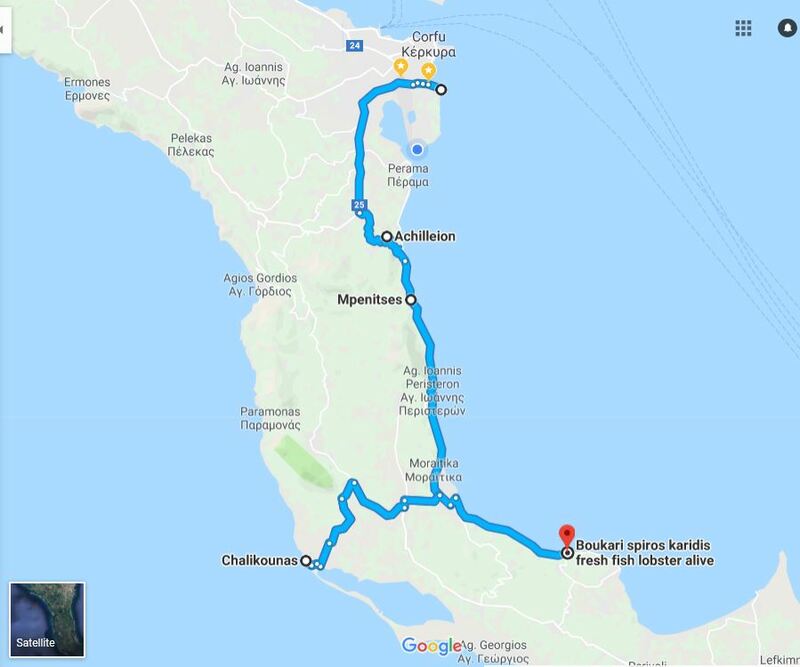 You may have dinner at Alexandros fish tavern in Gardenos (fresh and cheap fish) or at the other side of the island at Taverna Panorama or Savvas Taverna in Notos Beach. Also a very good seaside fish taverna is Limnopoula in Petriti. 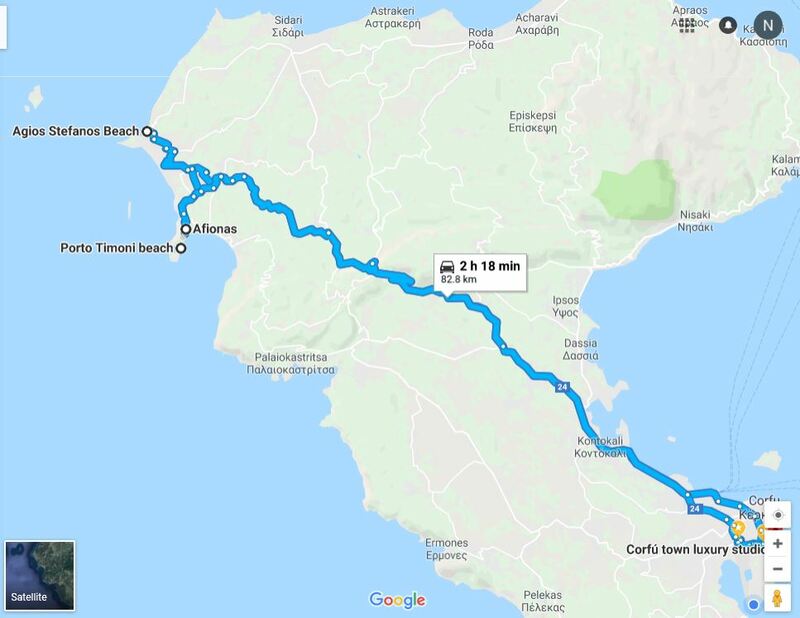 [Southern Corfu Trip-3 about 80 km]:Corfu Town, visit Achileion, Benitses village, swimming at Marathias Beach (several beach bars ,WaveBeachBar, crowded beach) . Dinner at Taverna Elia at 10′ by car towards south. [Rent a boat] from the kiosk that is found near the apartments and explore the Old fortress. Then head to the south, visit the Mouse Island and continue towards Benitses or Messongi for swimming and lunch.